Malta, Gozo and Comino are three small islands known for some of the best diving in Europe. Malta is relatively small and consists out of three large limestone islands; Gozo, Comino and Malta, separated in North and South. Further more there are four uninhabited islands named Fifla, Cominotto, St. Paul's and Fungus Rock. Malta is one of the most southern countries of Europe in the middle of the Mediterranean Sea which provides for excellent diving and snorkelling conditions. She is less than one hundred kilometers from Sicily, Italy and less than three hundred kilometers from North Africa. The water is quite cold for excellent coral growth to occur, but Malta has some very nice counterexamples. Don't expect to see as many fish as in the Red Sea, the water is just not warm enough, but visibilities definitely are as clear. In one word; diving in Malta is excellent less for the fish but more for the caves and underwater topology. The Climate is great with mild wet winters and hot dry summers. Best time for diving therefore is in the dry season which last from April to September. Temperatures range from 14 degrees in January to 32 degrees in August while water temperatures range from 12 to 28 degrees. April and November are the month where tourism is at its peak so in my opinion October is the best month although quite hot. Malta has become a diving destination, but other tourist attractions such as boating, dancing, pubs, bars, discos and beach tourism is well developed as well. It is a great country with a very rocky surface, steep cliffs and many shipwrecks, small reefs and caves. Because of the steep surface profile, dives can be quite deep close to shore. It is not an expensive country, not for diving but also not for accommodation, eating out and flying into its capital Valetta from many European cities and even on other continents is relatively cheap as well. WWII was also a bad time for Malta as it counted for the best base between Europe and Africa and both sides wanted to have this strategic island. Wrecks are covered around Malta especially near the harbour. Recently many artificial wrecks have been sunk to create extra tourist attractions. 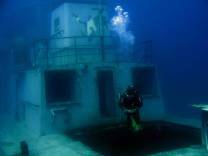 Some of the best known dive sites are the Blue Hole near Dwerja Point and HMS Maori, which is a spectacular British destroyer famous because it sank the Bismarck. Enjoy this diving paradise that tourist don't only visit for its spectacular under water landscape but for many other touristy events as well.